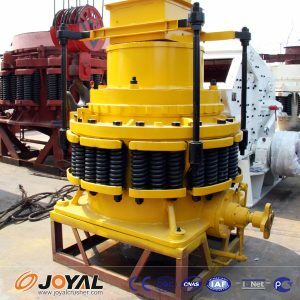 Cone crusher often appear in the gravel production line is commonly used in crushing processing of a processing machinery and equipment, crushing cone crusher than the large and processed out of gravel aggregate look good, Shanghai Joyal mining machinery remind the majority of Users pay attention to the cone crusher card material problem. Cone crusher card material is a reason, when the cone crusher because the card material can not run the problem, the most taboo is do not understand the reasons for direct handling, the general result of cone crusher card material phenomenon what? If the cone crusher in the process of ore crushing too much or uneven feeding and feed does not meet the standards will cause blocking phenomenon, it will suddenly increase the amount of current equipment, and circuit protection device will automatically stop the protection circuit. Material does not meet the requirements, which led to the phenomenon of the card machine, so Joyal remind everyone in the feed should be strictly in accordance with the operating standards into the material to avoid blocking problems.